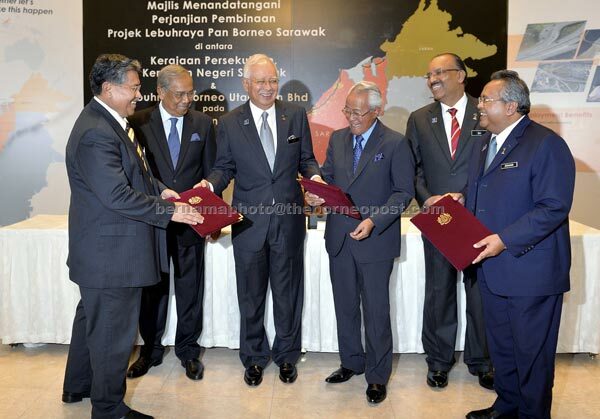 Prime Minister Datuk Seri Najib Tun Razak yesterday witnessed the signing ceremony of a memorandum of understanding (MOU) for construction of the 1,090km Pan Borneo Sarawak Highway involving the federal government, state government and Lebuhraya Borneo Utara Sdn Bhd (LBU). LBU has been appointed the Project Delivery Partner (PDP) to manage and supervise the implementation of the highway. The MOU was signed by the secretary-general of the Ministry of Works, Datuk Seri Zohari Akob; Sarawak State Secretary Tan Sri Mohamad Morshidi Abdul Ghani; and LBU chairman Tan Sri Abang Ahmad Urai Hakim Abang Mohideen. Also witnessing the signing were Sarawak Chief Minister Datuk Patinggi Tan Sri Adenan Satem, Chief Secretary to the Government Tan Sri Dr Ali Hamsa and Works Minister Datuk Seri Fadillah Yusof. Speaking to reporters after the ceremony, Fadillah said with the signing of the MOU, works on the first phase of the Pan Borneo Sarawak Highway involving a stretch of 773km should begin in September. He said works on the first phase would begin with the 33km Telok Melano to Sematan package, involving the construction of a new single carriageway which connects several small towns and villages in the Telok Melano District, which are now only connected by sea route. “The cost of constructing the Pan Borneo Sarawak Highway for 1,090km will be finalised after the final survey and design are completed,” he said, adding that the appointment of the contractor on the delivery would be decided via the tender process. “Toll will not be imposed on the highway as it is the main artery connecting all of Sarawak. “Toll will only be imposed if there are alternative roads,” he said. The Pan Borneo Sarawak Highway forms part of the Pan Borneo Highway which stretches 2,239km, linking major towns in Sabah and Sarawak. The overall cost of building the Pan Borneo Highway is RM27 billion and it is due for completion in 2020. In a statement issued yesterday, the Works Ministry said the government had decided that the Pan Borneo Sarawak Highway would be built using the Project Delivery Partner (PDP) concept whereby the cost would be fully borne by the Finance Ministry through the Infra Fund. “A similar model has been used for the Mass Rapid Transit (MRT) project. This concept was selected as it is more cost-effective and reduces government expenditure,” it said. The statement also said LBU which was appointed PDP would act as the single point of accountability which would be responsible for implementing, managing, and completing construction of the highway at a reasonable cost and duration agreed by the government. “In return, the PDP would receive a fee based on the achievement of the Key Performance Indicators (KPI) agreed upon,” it said. The statement also said an Executive Committee chaired by the Sarawak State Secretary, with the members comprising other agencies such as the Works Ministry, the Sarawak Public Works Department and the Sarawak Land and Survey Department would be responsible for monitoring, coordinating and resolving issues that may arise in the implementation of the project. “This committee will ensure the involvement of the Sarawak people is maximised in this project,” it said. Meanwhile, Adenan thanked the federal government following the signing ceremony today and was confident it would boost economic and development activities in the state. “At last, what we have been waiting for many years is beginning to come by. We are very grateful for it. Even though it will take several years but we are making a good start,” he said. Meanwhile, Fadillah denied that the construction of the Pan Borneo Highway was due to the coming state election but was the prime minister’s promise to the people of Sarawak during the last general election. “It is in the Barisan Nasional manifesto for the last general election and this is the prime minister’s promise to the people of Sarawak. It is in the Sarawakians’ wish list,” he said. Asked if the construction of the highway was at an appropriate time following the weak value of the Ringgit, Fadillah said it was a commitment by the government.